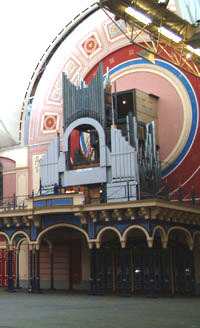 Membership of The Friends is open to all supporters of the APOA and the Alexandra Palace Organ restoration project. Friends receive a regular mailed newsletter and a membership card which qualifies them for discounted entrance to all our concerts and admission to Friends' meetings which we occasionally hold. The yearly subscription is £15, which like all funds we receive directly contributes to the continued use of the organ and its restoration. We regret that we are currently unable to offer membership to overseas residents due to postage costs. To join, simply print out, fill in and mail one of the following forms. Further details are contained on the forms themselves. Please note: You will need to use your browser Back button to return to this page since the navigation controls are missing from the forms. Membership form - Payment by Standing Order - please pay by standing order in preference to cheque since it is a simpler process for both you and The Appeal.